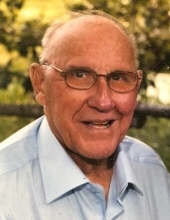 Howard Thomas Majury, passed away peacefully on Tuesday, January 29, 2019 at Foothills Country Hospice in Okotoks Alberta. Howard was born in Sherbrooke Quebec, the youngest son of Elizabeth and Thomas Majury. He was predeceased by his brother Norman in 1988 and Graydon in 2015. He is survived by his wife, and best friend, Mary (Bown) Majury. They had been married 69.5 years. He was a loving father to Janet (Murray) Lloyd, Sandy (Roger) Davis and Cyndi (Dan) Eldridge. Grandchildren : Tara Ross, Nathan (Kathleen) Ross, Becky Davis, Joe (Gabrielle) Davis and Jessica Eldridge, and four great grandchildren. He is survived by three nephews: Richard Majury, Arnold Macmillan and Neil Macmillan. His early years on the farm in southern Quebec are where his love of farming first flourished and his remarkable affinity to all animals developed. Animals were naturally drawn to him. Howard was known for having a variety of pets over the years including, skunks, foxes, raccoons and even a pigeon. As a young boy he raised his own Shorthorn steers while helping his Dad on the dairy farm. Over the years he also raised sheep (taking prize flock at the Royal Winter Fair in Toronto). In 1961, Howard and Mary moved to Stanstead. Although they built a new home in town, it was not long before Howard purchased a farm 7 miles outside of town. They bred Newfoundland dogs (much to the delight of Mary and daughters), and Polled Herefords. For several years, Howard and Mary enjoyed buffalo in an enclosure on the farm. In 1945 (at the age of 18) Howard started work with Southern Canada Power ( precursor to Hydro Quebec). He worked his way up in many different capacities (including lineman, power tester, and manager) until his retirement in 1983 from Hydro Quebec, as Manager of Distribution Services. Co-workers and employees have described him as an extremely intelligent, fair, broad minded man who was well respected and admired. Howard believed strongly in supporting his community and demonstrated this sense of responsibility in part, through his memberships in The Masons and Rotary Club, being a member of the Stanstead Town Council for several years, and a director then President of the Ayer’s Cliff Fair. He was a genuine, and honest gentleman, a skilled and entertaining speaker and tireless worker. Howard was a highly capable and intelligent man who excelled at whatever he undertook. From building a speed boat, to building more than one barn, maintaining and repairing home appliances or children’s toys, to restoring Model T cars from boxes of parts that looked like scrap metal, he could figure out how to build or repair anything he put his mind to. By the age of 90, he had restored 13 Model T’s. In 1988 , Howard and Mary decided to move to Alberta to be closer to their children and their families. It was here that Howard built the Foothills Pet Resort dog kennel for his daughter and worked in the kennel for many of his retirement years. He joined the local Model T Club and developed his love for all things Model T. Howard and Mary enjoyed travelling and drove their RV all over North America enjoying meeting up with friends in many different places. In more recent years it was important to Howard that he and Mary live in their home together for as long as possible. He met this goal as they remained together in their home until he was admitted to hospice 3 weeks prior to his death. A Memorial Tea will be held from 2:00 - 5:00 pm on Saturday February 9, 2019 at Snodgrass Funeral Home in High River Alberta. If friends or family wish to share a story or a few words in tribute to Howard, please plan to do so, or forward your tribute/story to sandydavis@shaw.ca to be shared at the Memorial. In lieu of flowers, if desired, donations may be made in Howard’s name to The Foothills Country Hospice, Box 274, Okotoks AB T1S 1A5, Alberta Cancer Foundation, 1620 29 St NW, Calgary AB T2N 4L7, www.albertacancer.ca/donate or any Animal Rescue Agency of your choice. To send flowers or a remembrance gift to the family of Howard Thomas Majury (Cayley), please visit our Tribute Store. "Email Address" would like to share the life celebration of Howard Thomas Majury (Cayley). Click on the "link" to go to share a favorite memory or leave a condolence message for the family.